The City of Springfield (City) is the heart of Effingham County, Georgia. The City used Geographic Information System (GIS) technology in-house constantly challenged with personnel, hardware, and software issues. 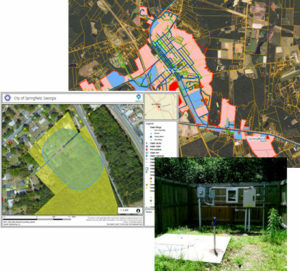 Recently, the City contracted Spatial Engineering, Inc. (SPATIAL) to migrate their existing CADD and GIS data which included roads, buildings, parcels, water system, wastewater system, zoning, and more into RightSpot GIS Services. The city is constantly bombarded by developers and property buyers to find information on current zoning parameters on tax parcels. With all the benefits that RightSpot service provides to the city, Spatial Engineering added functionality to allow reporting of zoning and flood zone verification for tax parcels. Through this functionality, the city users are able to generate a report in seconds on any parcel within the city limits. This report is compiled into a simple sharable Adobe PDF document that can be provided to property requestors quickly.